When you walk into a party, the first thing you notice is the decor. Do you want to make a "Wow" statement? A lot of times, it's the little details that complete the whole setting. This party is a very good example of how it all comes together! 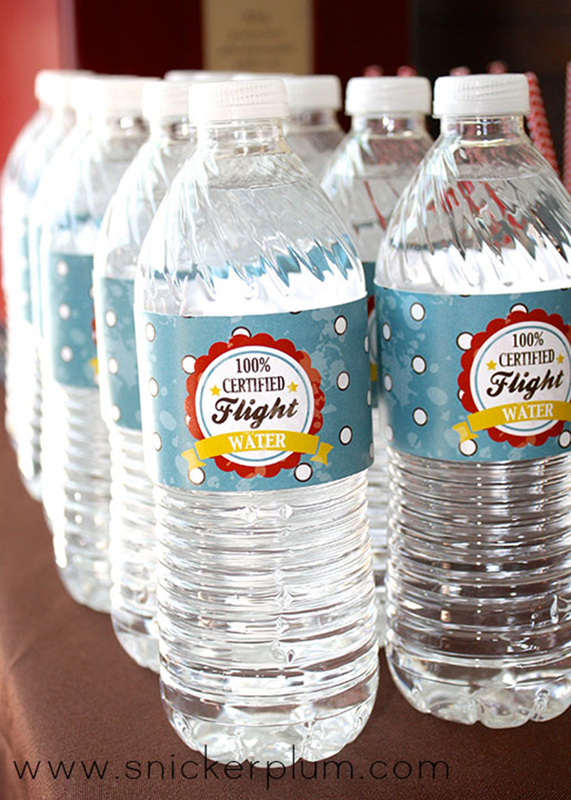 In the complete party package the water bottle wrappers, tags to use on custom mason jar cups, vinyl to go on jars to hold the silverware, and personalized cupcake toppers are just some of the custom details. The beverage tags come pre-punched in the printed and shipped package and you get 24 of them! I attached them with this adorable, vintage pom-pom style ribbon at a darling local boutique, but you can find some online I'm sure! 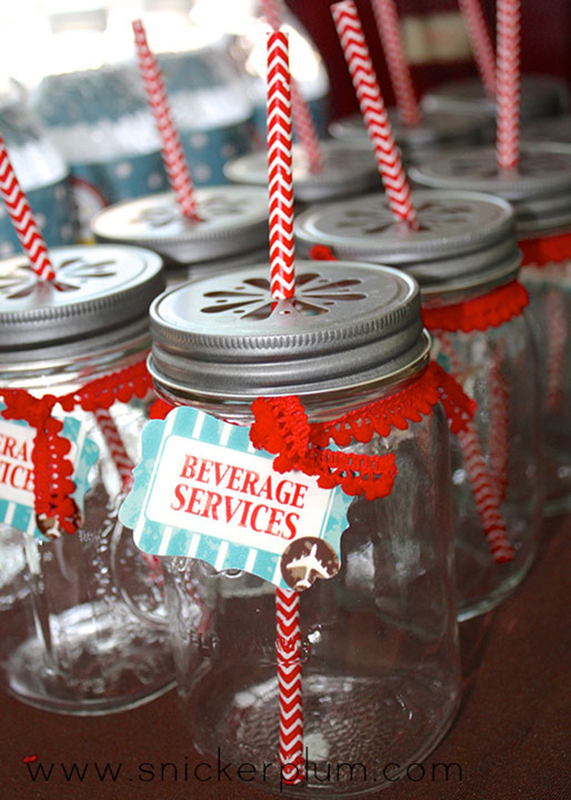 Notice the cute mason jar lids? You can get them here! And what's a custom party, without custom paper straws? Aren't these new chevron straws amazing!!! I get my straws from Sip Sticks. 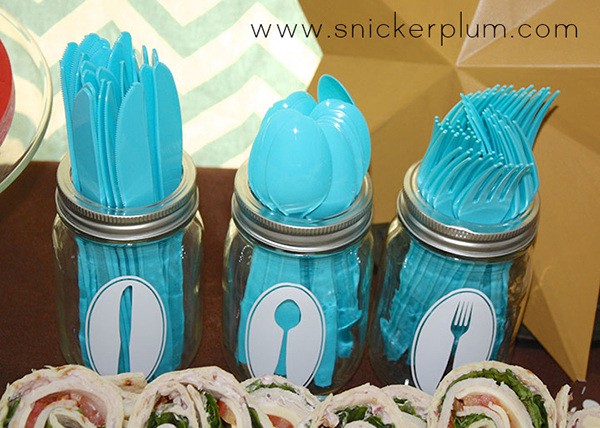 You can find links on the sidebar of this blog for the lids and the straws! These watter bottle wrappers are really popular right now. I try and include them in every one of my party packages. Again, in this package, you will get 24 of these wraps. They are pre-cut so all you have to do is glue them onto the bottles, over the existing labels already on them. I like a glue gun the best. Sticks even to cold water bottles. These just happen to be one of my favorite things! These designs are from Vineyard Vinyl. They come on a sheet for you to apply to any jars or containers you are using for your silverware. If you use colored silverware, it will make these vinyl designs POP even more. You can also get the stickers in other colors. Aren't these cute? And lets' just mention that since they are chocolate, they are also delicious! 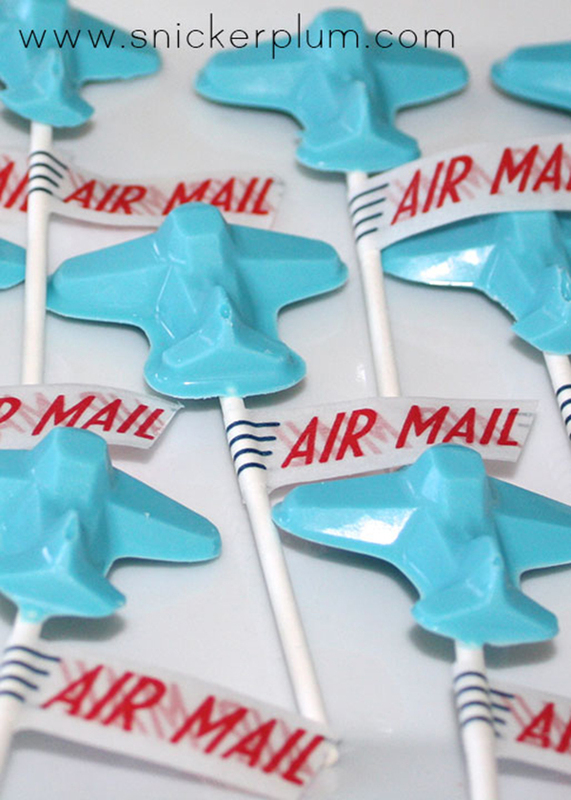 I had an airplane chocolate mold and sucker sticks to make these chocolate suckers. You can check out my last post for more details on how to create these little favors. 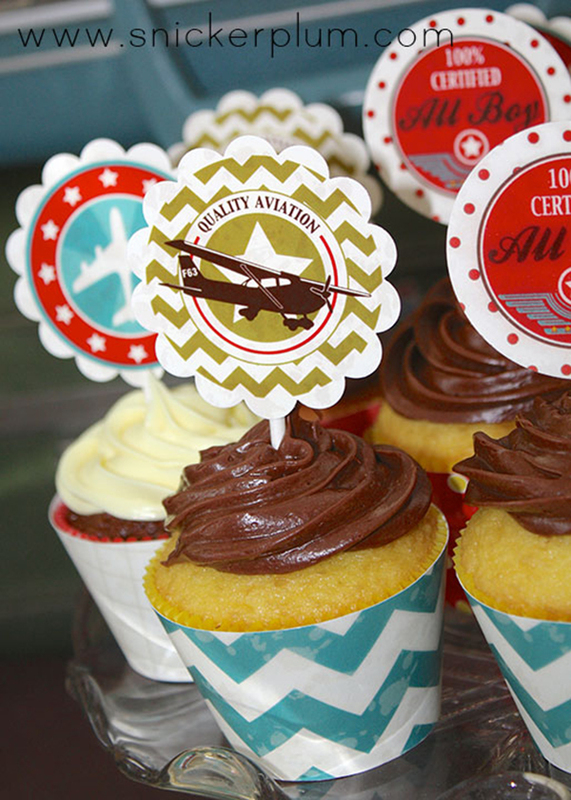 These cute toppers and cupcake wrappers also come in the comlete package. You can also purchase these separately if you want to print and cut them yourself. Or there is another option of purchasing the toppers already printed and pre-cut to be shipped to you! 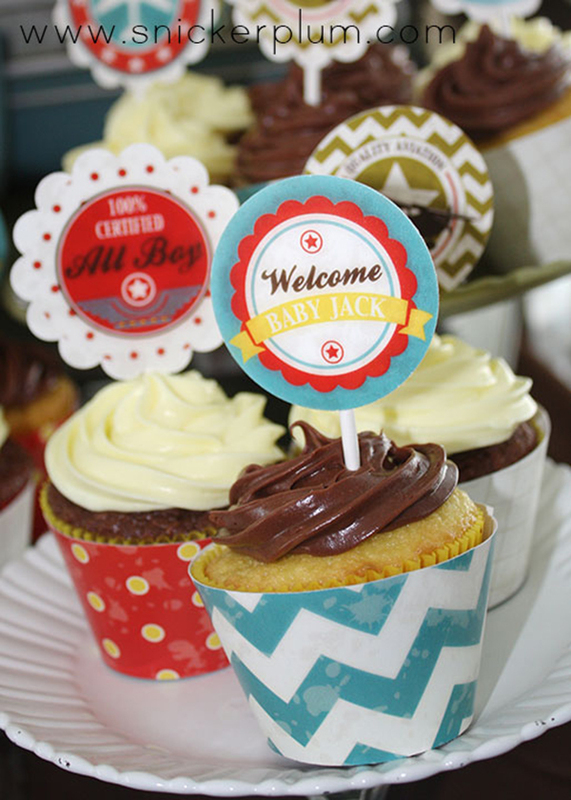 These toppers can be generic, or you also have the choice of personalizing them to your needs! 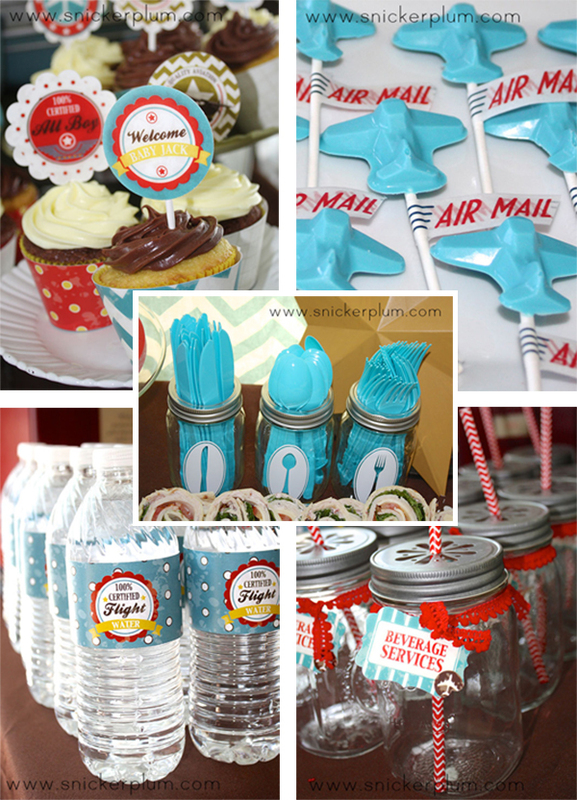 Using just the toppers as a tag to go around a drink, a favor bag, or even attached to a sucker would be darling! The last little detail you can consider for your party is a "thank you gift" for each of your guests as they walk out the door. Because of the experience I have with my own personal parties, I find that the more convenient things are laid out, the less stress it is for me. I've learned through trial and error, that having the thank you gifts ready and on display near the door, is the best solution for parties and guests. I don't have to worry about making sure to hand out anything to everyone before they leave. The only thing I do is make an announcement that everyone needs to grab one on their way out! I mentioned in the first post that one of my favorite vendors, TIffany, made these cookies. 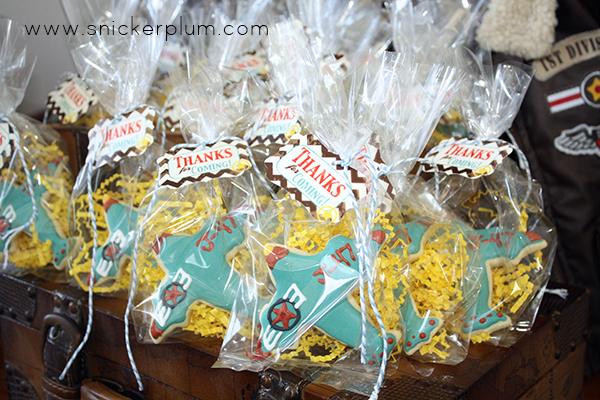 We tied the thank you tags around cellophane bags filled with paper shreds, both purchased from Hobby Lobby. Remember, on each party there are several options for you to customize and fit your needs. You can purchase the printed whole package ready to ship, you can but the digital package and you can print from home. There are other options as well for purchasing a few indiviudal items from the store if you don't want the whole party. 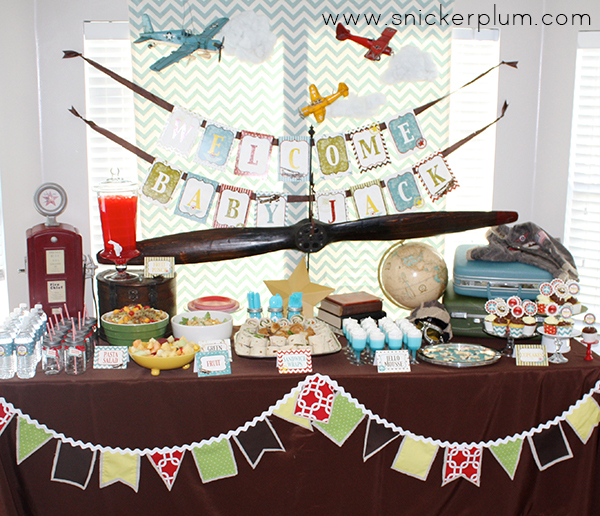 Whatever you choose, You will have what you need to help create a cute Aviator party for your little guy!